DIY Diva Laurel McMillan learns that the high walls and guarded gates of Hawkeye Haven can't protect her community. When Laurel takes her pampered, chocolate Labrador retriever, Bear, for an early morning walk, she finds her friend, security guard Bessie, bleeding and unconscious at her guardhouse post. If the attack on Bessie isn't enough to set the residents' nerves on edge, the murder of Victor Eberhart, the unpopular president of the powerful homeowners' association, certainly does the trick. Despite teaching DIY classes and writing project instructions for her latest book, DIY for Dog Lovers, Laurel manages to squeeze in time for some DIY detective work. But as she gets closer to the truth, Victor's killer would like nothing better than for the DIY Diva to take a dive. Available in both e-book and paperback editions! Death by Association Paula Darnell is a different cozy, and it’s excellent. I loved the small town vibe of the gated community and our Protagonist Laurel is a great addition to the Cozy Family. A refreshing read. A great cover that is attractive and beckons the reader to purchase and turn those pages! I enjoyed Death by Association. The author is very talented in her descriptive writing and pulled me into the community from the very beginning. 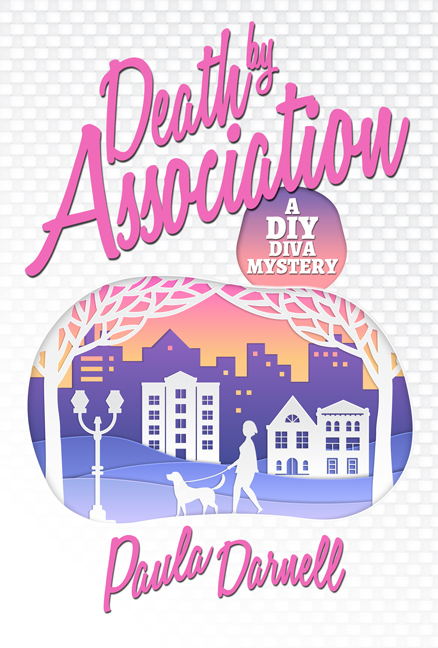 Death by Association, A DIY Diva Mystery, is published by Cozy Cat Press.